Vanguard University is an amazing place. It is so, because it is a place that provides students with much more than just an education centered around Christ. What sets Vanguard apart from many University’s across California and even the country, is those who wake up everyday to come to school to make an impact on the students. From the professors and the administration, to the custodial crew, Vanguard students are surrounded by people with an unbelievable amount of knowledge and experience just waiting to be passed on. Another group of people that make a huge impact on the lives of students is those that head the athletic program, specifically the coaches. Vanguard’s athletic programs have some of the best coaches, not only when it comes to X’s and O’s, but when it comes to the things that young athletes need the most, guidance. One coach that has mad a huge impact on many of his players, and even more athletes from Vanguard’s other sports teams, is Taylor Kelly. 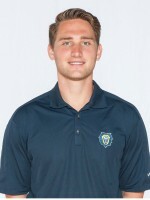 For the past two years, Taylor has been the assistant coach for the Vanguard University Men’s Basketball team. 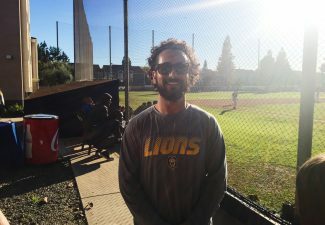 He joined the team after spending a year coaching as California State University Dominguez Hills. When former men’s assistant coach Brian “Boomer” Roberts left Vanguard to pursue a head coaching job in Chicago, Head Coach Rhett Soliday knew exactly who would fill his spot. After spending his first two years playing basketball at Fresno State, Taylor found himself needing to be somewhere else, Vanguard was that place. 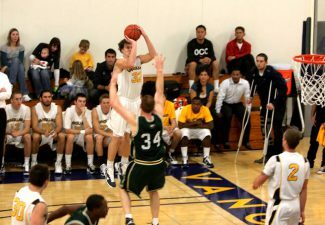 He transferred to Vanguard University with three years left to play and made the most out of these years on and off the court. On the court Taylor was a two-year captain, an NAIA Scholar Athlete, a three-time Golden State Athletic Conference Scholar Athlete and currently ranks among the top-five in Vanguard men’s basketball history in career 3-point field goals made as well as in 3-point field goal percentage. After his senior season, he was named VU Male Athlete of the Year and won the Champions of Character Award for the athletic department. The Champions of Character Award is a perfect example to use to show Taylor’s personality off the court. He is a character. When he was not splashing jumpers on the court, he could be seen with a huge smile on his face, spreading his humor around campus. This is exactly how he builds relationships with his players and with all who know him. He uses his infectious, funny, loving personality to comfort anyone who seeks his counsel. No matter the time or day, Taylor, or better known to those close with him as TK, is always there for anyone who needs him. Because Vanguard has made such a huge impact on his life, Taylor feels like God has called him to give back to a place that has given him so much. “Vanguard had a tremendous impact on molding me into the man that I am today and I consider it a blessing to be able to give back to the community which I care so much for” he says. Spend five minutes with him in the Cafe enjoying one of his hand-crafted salads and you will clearly see how much he loves Vanguard University and everyone associated with it. This is why he gives so much of his time and so much of his heart to the athletes and to the people here. Whether that be through his coaching, or through leading the athletics ministry program, or even teaching one of his fitness classes, Taylor invests all that he can to give back to Vanguard. When you genuinely love something, you give it a lot of your time. Taylor Kelly loves Vanguard with all of his heart and he gives back an unbelievable amount of time to show this love.